The pitch attitude of an airplane is the angle between the longitudinal axis of the airplane and the actual horizon. In level flight, the pitch attitude varies with airspeed and load. For training purposes, the latter factor can normally be disregarded in small airplanes. At a constant airspeed, there is only one specific pitch attitude for level flight. At slow cruise speeds, the level flight attitude is nose-high with indications as in Figure 7-47; at fast cruise speeds, the level flight attitude is nose-low. [Figure 7-48] Figure 7-49 shows the indications for the attitude at normal cruise speeds. Figure 7-47. Pitch attitude and airspeed in level flight, slow cruise speed. Figure 7-48. Pitch attitude decreasing and airspeed increasing—indicates need to increase pitch. 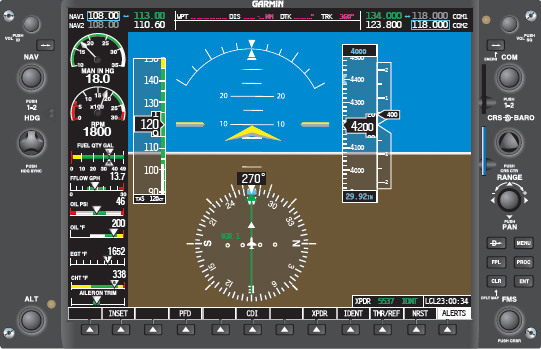 The instruments that directly or indirectly indicate pitch on the primary flight display (PFD) are the attitude indicator, altimeter, vertical speed indicator (VSI), airspeed indicator (ASI), and both airspeed and altitude trend indicators. Figure 7-49. Various pitch attitudes (right), aircraft shown in level flight. The attitude indicator gives the pilot a direct indication of the pitch attitude. 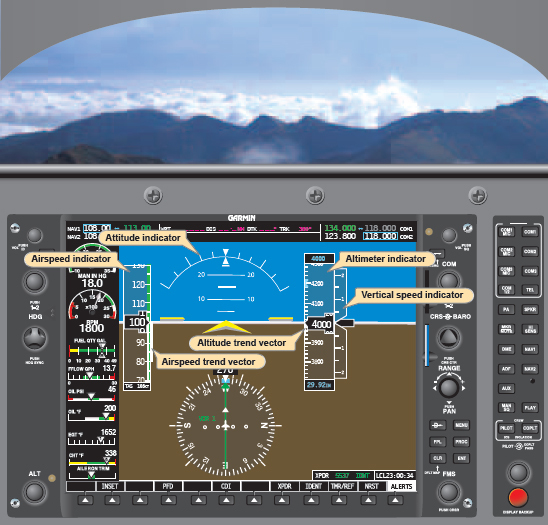 The increased size of the attitude display on the EFD system greatly increases situational awareness for the pilot. Most attitude indicators span the entire width of the PFD screen. The aircraft pitch attitude is controlled by changing the deflection of the elevator. As the pilot pulls back on the control yoke causing the elevator to rise, the yellow chevron begins to show a displacement up from the artificial horizon line. This is caused by the AHRS unit sensing the changing angle between the longitudinal plane of the earth and the longitudinal axis of the aircraft. 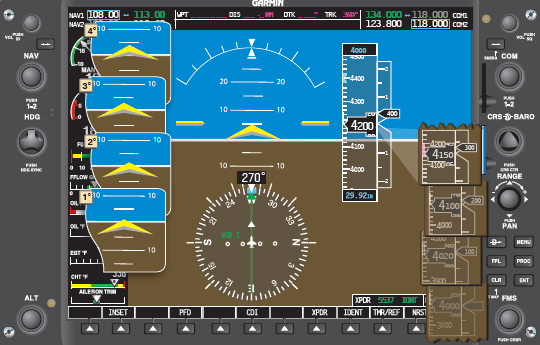 The attitude indicator displayed on the PFD screen is a representation of outside visual cues. 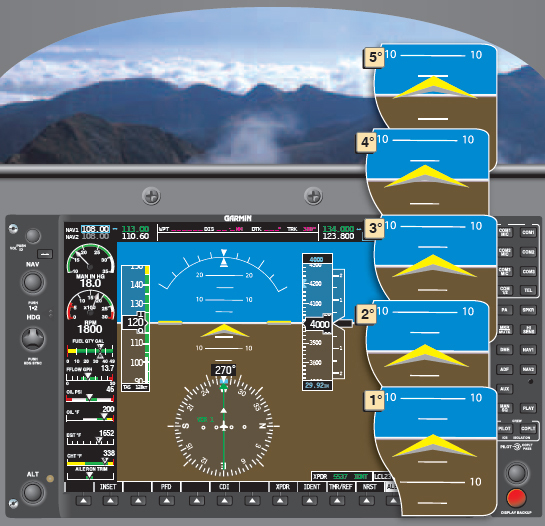 Rather than rely on the natural horizon visible during visual flight rules (VFR) flight, the pilot must rely on the artificial horizon of the PFD screen. During normal cruise airspeed, the point of the yellow chevron (aircraft symbol) is positioned on the artificial horizon. Unlike conventional attitude indicators, the EFD attitude indicator does not allow for manipulating the position of the chevron in relationship to the artificial horizon. The position is fixed and therefore always display the pitch angle as calculated by the AHRS unit. The attitude indicator only shows pitch attitude and does not indicate altitude. A pilot should not attempt to maintain level flight using the attitude indicator alone. It is important for the pilot to understand how small displacements both up and down can affect the altitude of the aircraft. To achieve this, the pilot should practice increasing the pitch attitude incrementally to become familiar with how each degree of pitch changes the altitude. [Figures 7-50 and 7-51] In both cases, the aircraft will slow and gain altitude. Figure 7-50. Pitch indications for various attitudes (1° through 5°). Figure 7-51. Pitch illustrated at 10°. The full height of the chevron is approximately 5 degrees and provides an accurate reference for pitch adjustment. It is imperative that the pilot make the desired changes to pitch by referencing the attitude indicator and then trimming off any excess control pressures. Relieving these pressures allow for a more stabilized flight and reduces pilot work load. Once the aircraft is trimmed for level flight, the pilot must smoothly and precisely manipulate the elevator control forces in order to change the pitch attitude. To master the ability to smoothly control the elevator, a pilot must develop a very light touch on the control yoke. The thumb and two fingers are normally sufficient to move the control yoke. The pilot should avoid griping the yoke with a full fist. When a pilot grips the yoke with a full fist, there is a tendency to apply excess pressures, thus changing the aircraft attitude. Practice making smooth, small pitch changes both up and down until precise corrections can be made. With practice, a pilot is able to make pitch changes in 1 degree increments, smoothly controlling the attitude of the aircraft. The last step in mastering elevator control is trim. Trimming the aircraft to relieve any control pressures is essential for smooth attitude instrument flight. To accomplish this, momentarily release the control yoke. Note which way the aircraft pitch attitude wants to move. Grasp the control yoke again and then reapply the pressure to return the attitude to the previous position. Apply trim in the direction of the control pressure. Small applications of trim make large changes in the pitch attitude. Be patient and make multiple changes to trim, if necessary. Once the aircraft is in trim, relax on the control yoke as much as practicable. When pressure is held on the yoke, unconscious pressures are applied to the elevator and ailerons, which displaces the aircraft from its desired flightpath. If the aircraft is in trim, in calm, non-turbulent air, a pilot should be able to release the control yoke and maintain level flight for extended periods of time. This is one of the hardest skills to learn prior to successfully flying in instrument meteorological conditions (IMC). At constant power, any deviation from level flight (except in turbulent air) must be the result of a pitch change. If the power is constant, the altimeter gives an indirect indication of the pitch attitude in level flight. Since the altitude should remain constant when the airplane is in level flight, any deviation from the desired altitude signals the need for a pitch change. For example, if the aircraft is gaining altitude, the nose must be lowered. In the PFD, as the pitch starts to change, the altitude trend indicator on the altitude tape begins to show a change in the direction of displacement. The rate at which the trend indicator grows and the altimeter numbers change aids the pilot in determining how much of a pitch change is necessary to stop the trend. As a pilot becomes familiar with a specific aircraft’s instruments, he or she learns to correlate pitch changes, altimeter tapes, and altitude trend indicators. By adding the altitude tape display and the altitude trend indicator into the scan along with the attitude indicator, a pilot starts to develop the instrument cross-check.